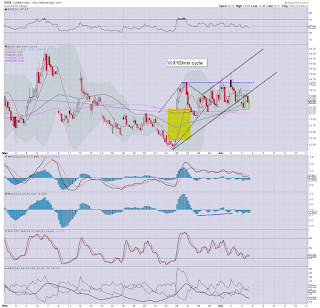 With equities holding gains into the close, the VIX settled -3.6% @ 13.73 (intra low 13.40). Near term outlook is mixed, with a small opportunity for downside to the sp'2080s - with VIX 16s, before renewed equity upside into the next FOMC of June 17th. Market volatility remains incredibly low considering Greece remains on the edge of a cliff. As things are, I'd guess Greece will manage to kick the can into July.. or August.. but will default/GREXIT later this year. For the moment, the big VIX 20 threshold looks out of range for some weeks... at least until after the next FOMC (June 17th). US equities closed notably positive, sp +4pts @ 2114 (intra high 2121). The two leaders - Trans/R2K, settled higher by a significant 1.2% and 1.0% respectively. Near term outlook is mixed, with new historic highs due in some (certainly not all) indexes into the next FOMC of June 17th. *closing hour was mild chop... nothing much for either side to tout. A bit of a messy day, but there was a clear morning upside break above resistance of sp'2115. The daily close is borderline within the downward trend (from 2034), although the low sp'2080s look a damn tough challenge before the week concludes. Best guess? Moderate chance of further weakness before the weekend, but new historic highs - in the 2160/80 zone look due within a few weeks. the usual bits and pieces across the evening to wrap up the day. 3pm update - another weak closing hour? 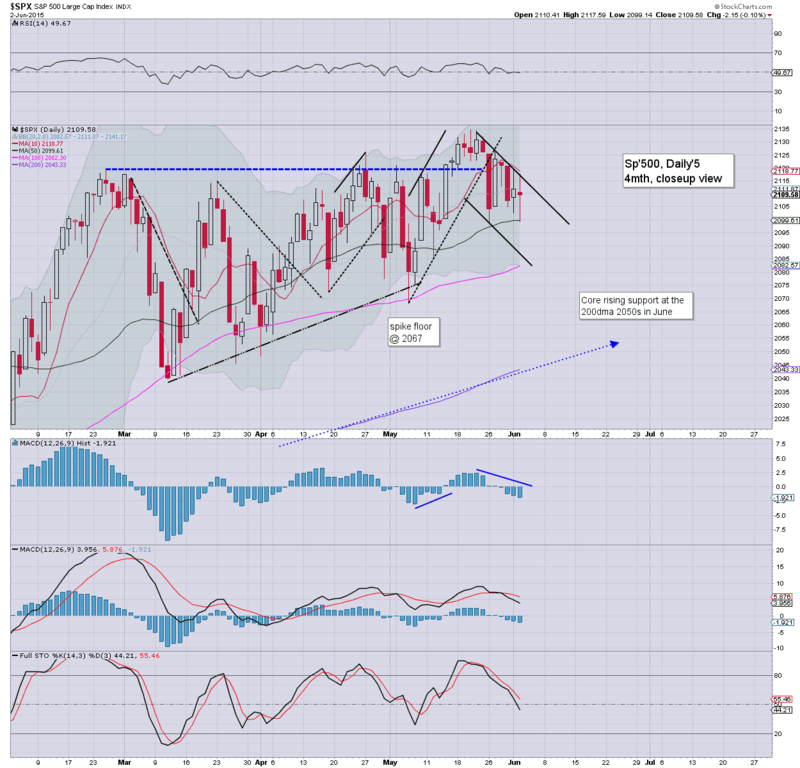 US equity indexes are holding moderate gains, with the sp'500 above key resistance. The smaller 5/15min cycles are offering a minor snap lower into the close. Equity bears should be desperate for a daily close <sp'2115.. if not <2110. Metals and are both weak, despite the cooling USD. 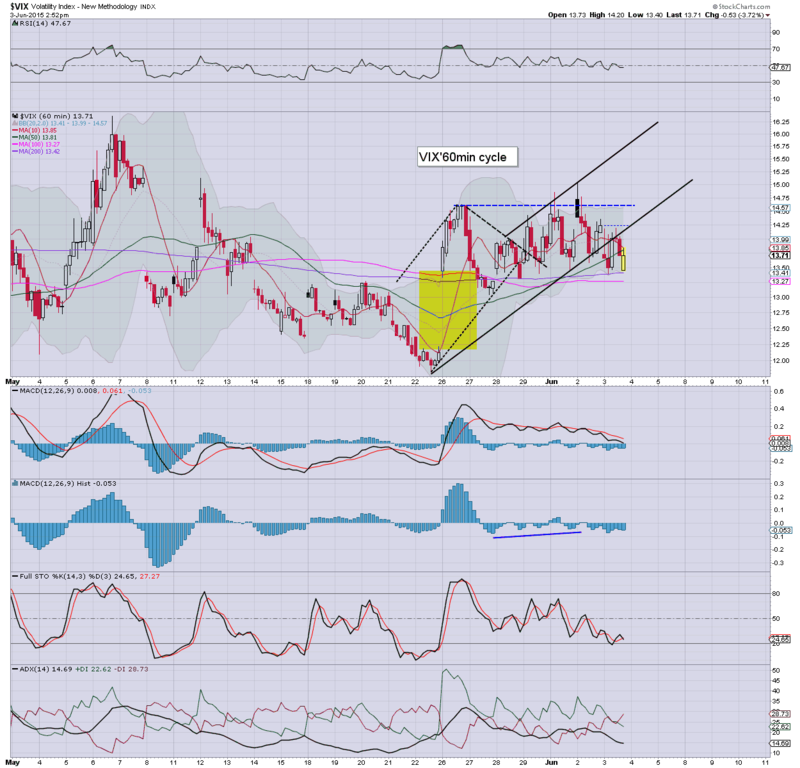 *incredible market complacency -as reflected in the VIX.. as Greek remains close to the edge. A daily close <sp'2110 would keep open the door to a washout in the low sp'2080s before the next wave higher (into FOMC of June 17th). Fed official Bullard (the one who helped mark the mid Oct' low) is holding a press' conf at 4pm. 3.05pm... 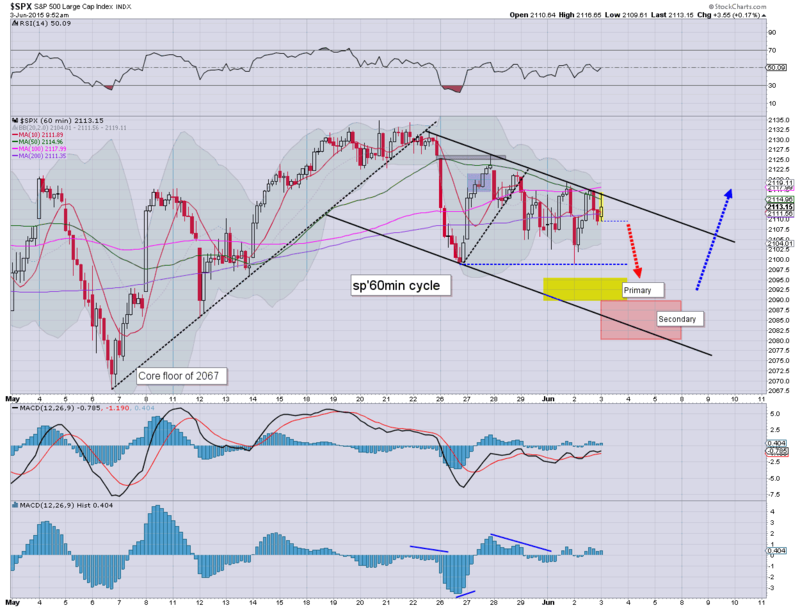 In theory.. a daily close of 2105 is viable.. esp' supported on the smaller 5/15/60min cycles. Will the bears show up? 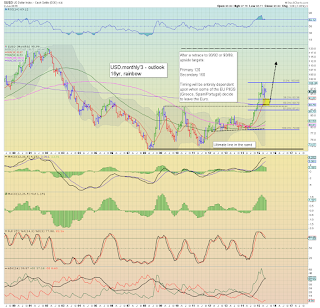 From a pure cyclical perspective.. the setup is near perfect. 3.18pm.. a touch weakness @ sp'2114.... Hmmmmm. Eyes to the VIX ! 3.20pm.. The more important hourly cycle set to turn negative at the Thursday open... certainly favours the bears. 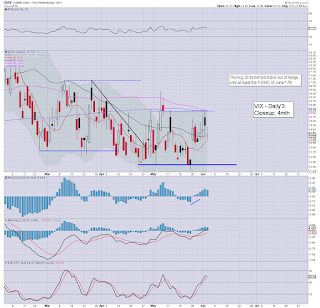 .. seeking a daily VIX close in the low 14s. Equities are holding minor gains, sp +4pts @ 2114 - back under (broken) resistance, ahead of the latest Fed beige book (due 2pm). USD has recovered a little from earlier lows, -0.4% in the DXY 95.40s. 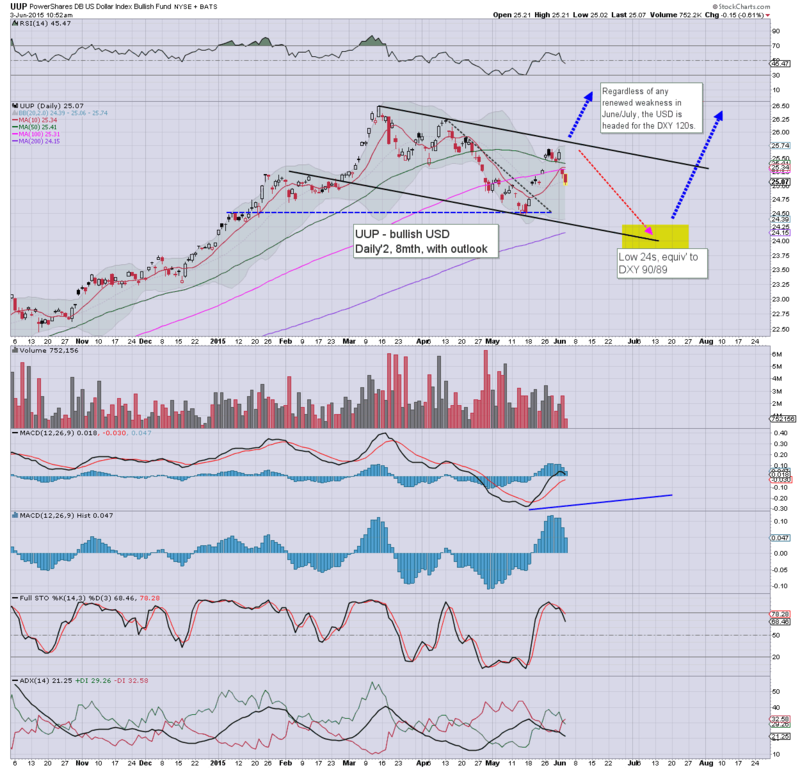 Metals remain weak, Gold -$9. 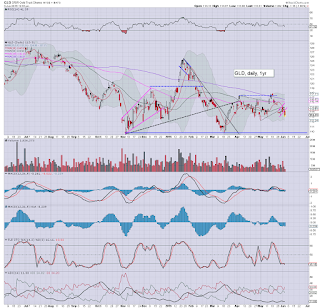 Oil is seeing some rather severe downside, -3.0% in the $59s. A daily close UNDER resistance of sp'2115 is absolutely essential for ANY hope of the low sp'2080s.. whether tomorrow or Friday. 2.01pm... a rosy coloured fed book... largely claiming is fine. Equities a touch higher.. sp +6pts @ 2115. As ever.. typical turn time is around 2.30pm... so now its again a case of whether we'll see weakness into the close. 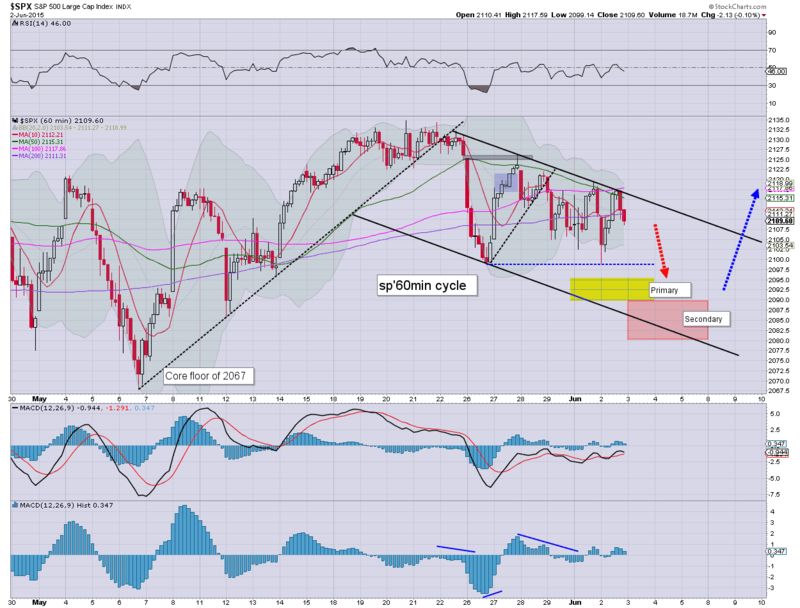 For the bears.. at least the smaller 5/15min cycles are offering a rollover from current levels. Whilst equities hold minor gains, there has been a notable snap lower in the precious metals. 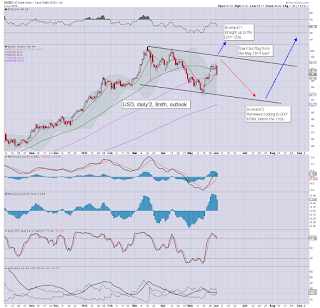 Broader price formation on the daily and weekly cycles remain bear flags within a viable giant H/S formation... the psy' level of $1000 for Gold looks due this summer/early autumn. *understand my focus this hour on Gold.. which I remain short. 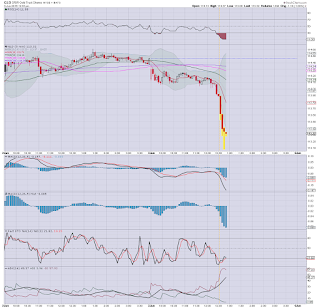 Relative to the USD weakness, this is a really dire performance for the metalic relic. As for equities, we have an interesting afternoon ahead, with a Fed beige book and two fed officials due to speak. The daily close will be VERY important. Arguably, equity bears need a sub sp'2110 close to hold out a 'moderate hope' that the low 2080s are still viable before the weekend. 12pm update - failed break? US equities are cooling ahead of a number of US Fed aspects this afternoon. 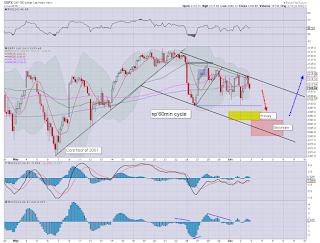 The equity bears should be desperate for a daily close <sp'2110. USD remains weak, -0.5% @ DXY 95.30s. 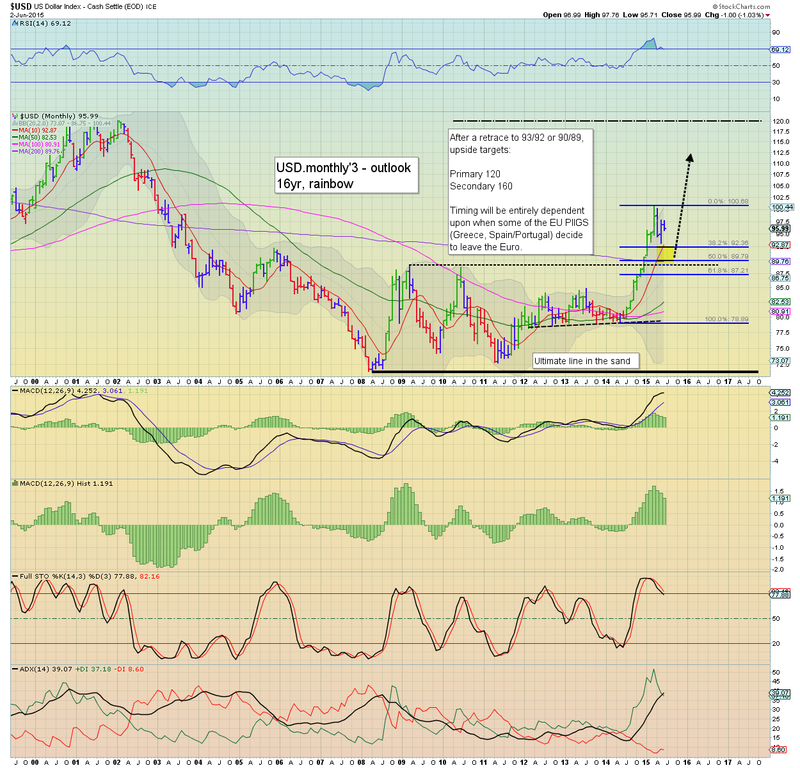 Metals remain weak, Gold -$3... performing very badly... relative to the USD. *metals not looking great, there is a clear $20 downside viable in the near term for spot Gold prices, equiv to GLD -$2 to the low 112s. Things are getting kinda interesting again. Equity bears should be desperately clawing for a daily close <2110. 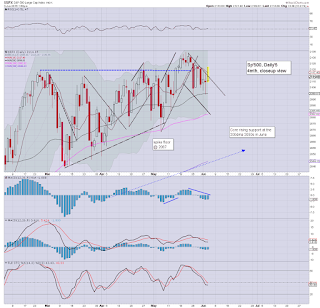 US equities break above declining resistance of sp'2115... climbing to a morning high of 2121. 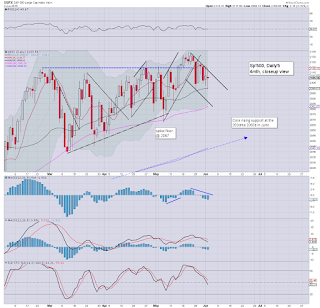 With the upside break, hopes of 2090/80 zone are now rapidly fading to nothing. If the market likes the Fed beige book (2pm), along with comments from fed officials Evans and Bullard... probable upside into early Thursday. *despite early strength, the USD is lower for the second day.. and the DXY 94s are now well within range. A clear fail for the equity bears... and there is little reason for any of the short term bears to still be holding. Price action is pretty lacklustre though, but an upside break IS an upside break. 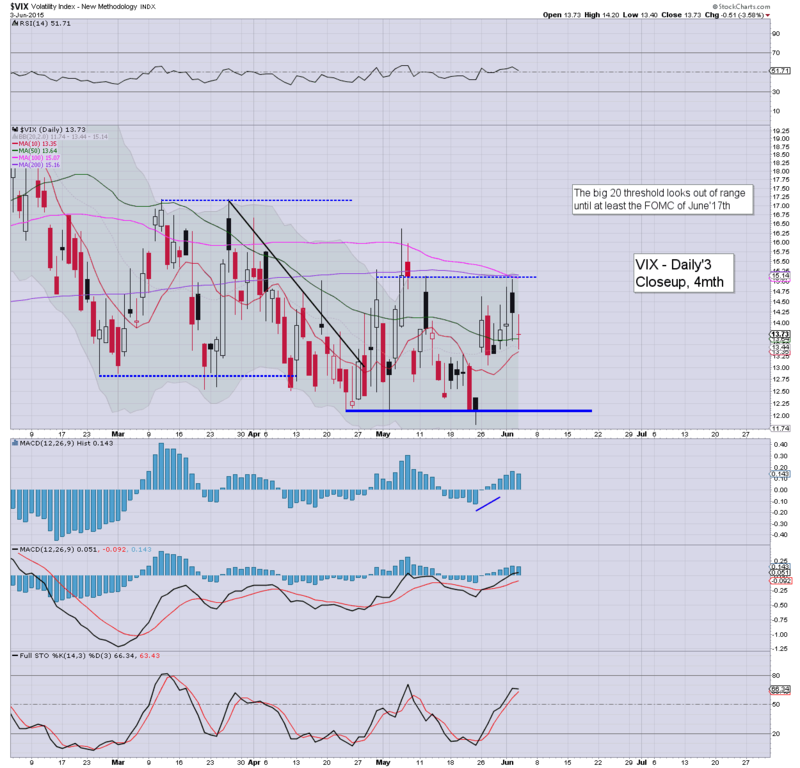 VIX is confirming the utter lack of market concern about Greece, -5% in the mid 13s. US equity indexes open higher, but the gains look highly vulnerable to reversing. USD has turned lower, -0.2% in the DXY 95.60s... post Draghi depression? Metals are weak, Gold -$3, with Silver -1.1%. 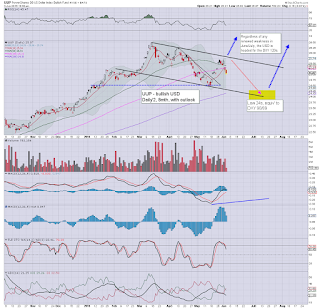 *price structure in the metals remains a bear flag... within a viable giant H/S formation. 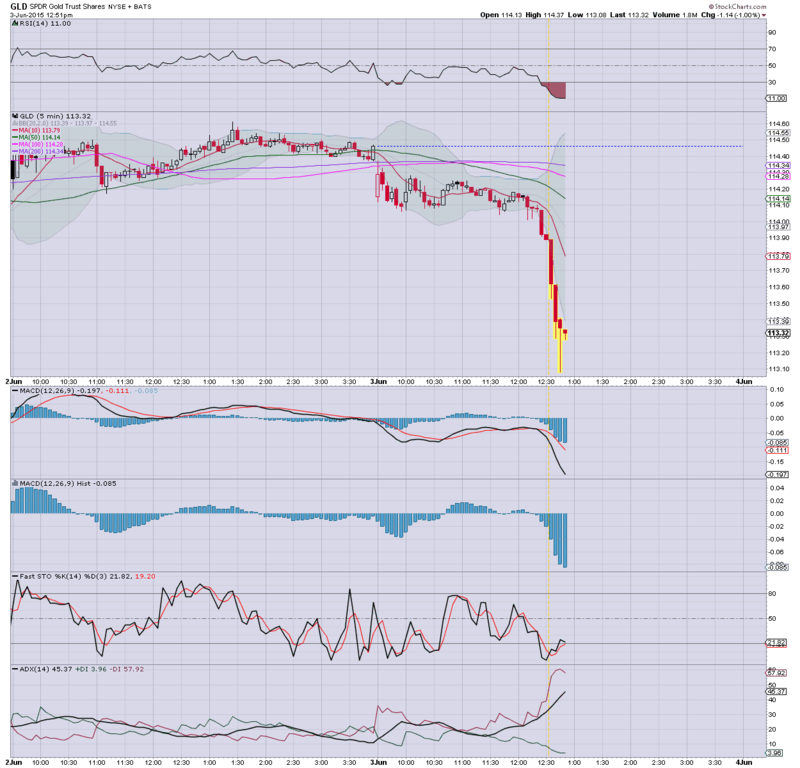 Outlook remains bearish... and I'm still short Gold - via GLD. In equity land... The battle continues! 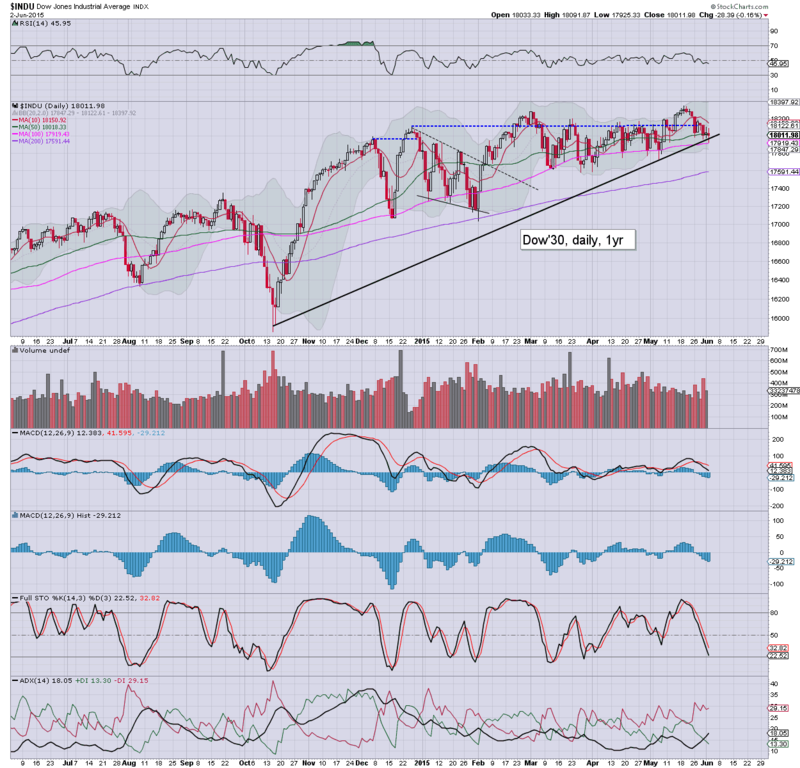 It is very clear how important the declining trend/resistance currently is... market is really respecting that line. Right now.. the door remains open to a mini washout in the low sp'2080s... along with VIX 16s. notable strength, social media, FB/TWTR, both +2%.. as the momo chasers re-appear. 10.01am ISM serv' sector, 55.7... not great... but not dire either. The weaker USD is really helping prop up a lot of asset classes this morning. Good morning. Futures are moderately higher, sp +10pts, we're set to open at 2119. 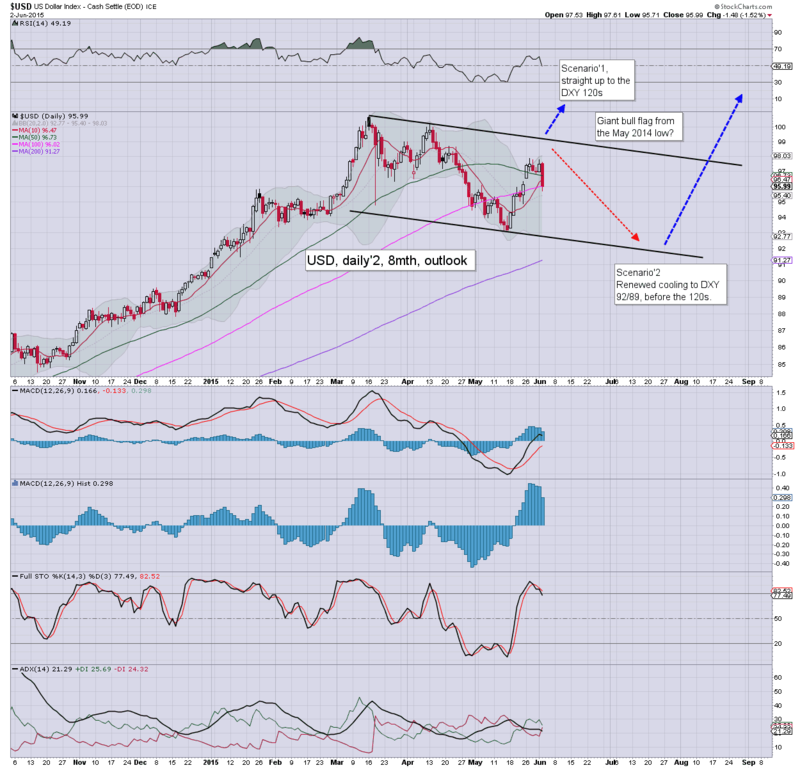 USD is bouncing, +0.4% @ DXY 96.10s. Metals are a little lower, Gold -$2. Oil is shaky, -1.3%, as the OPEC meeting looms this Friday. Like Mon/Tuesday, a break above would surely negate any chance of renewed weakness to the sp'2080s. 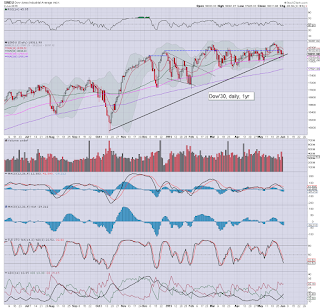 Equity bears should be desperate for a pre-market swing back <2115, or this could spiral out of control to the upside. Right now... it not looking good. 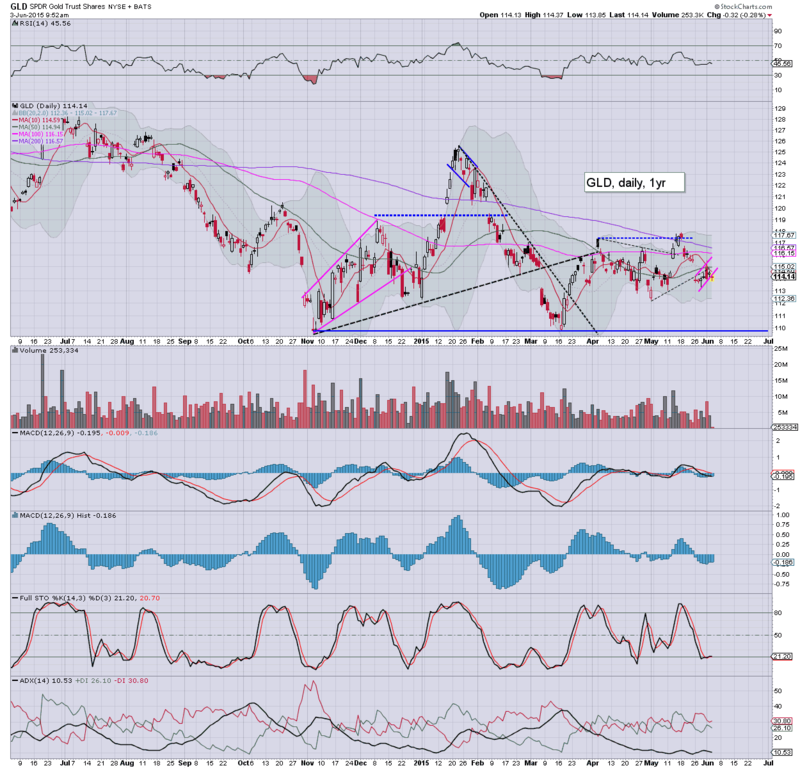 Certainly, I agree with Mr C. on Gold, the H/S formation, if correct would be highly supportive of Gold falling to the giant $1000 threshold by the early autumn. 8.16am.. ADP jobs: 201k vs 165k previous... one of the better data points in recent weeks. Bodes 'okay' for the Friday jobs data. ..Draghi talking.... its getting a little tiresome already, these press' conferences feel like they last many.... many hours. As the chatter on Greece continued, the USD saw a major net daily decline of -1.5% @ DXY 95.99 (intra low 95.71). 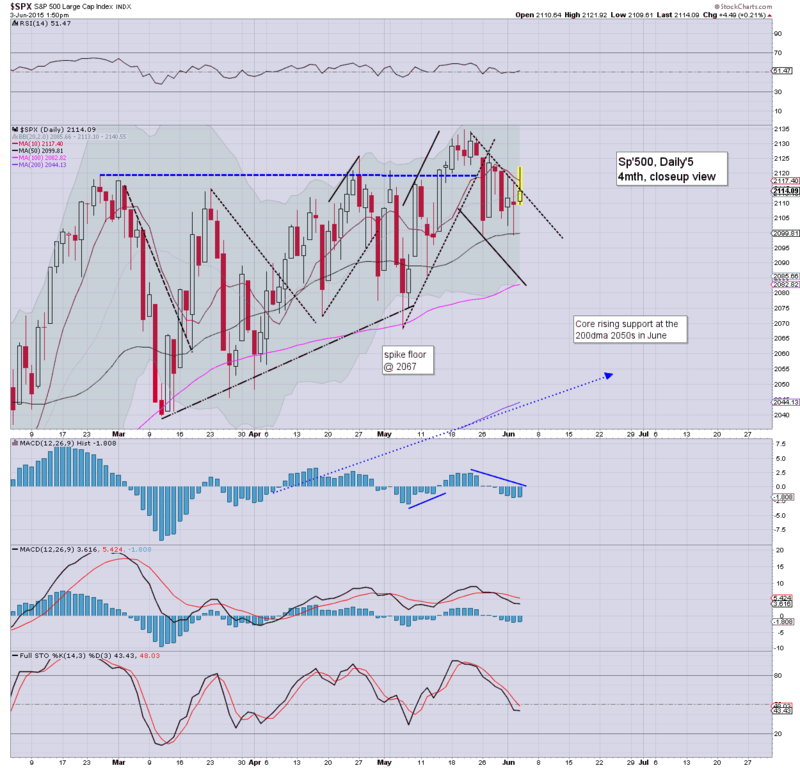 The broader trend remains unquestionably bullish, but a retrace to the low 90s into July now looks increasingly probable. It has been a long day... and I've nothing more to add on the USD. Wed' will see ADP jobs, intl. trade, ISM/PMI service sector data, with a Fed beige book (2pm). Fed officials Evans and Bullard are due to speak in the afternoon. A second day of moderate chop.. with marginal lower highs.. and lower lows for most indexes. 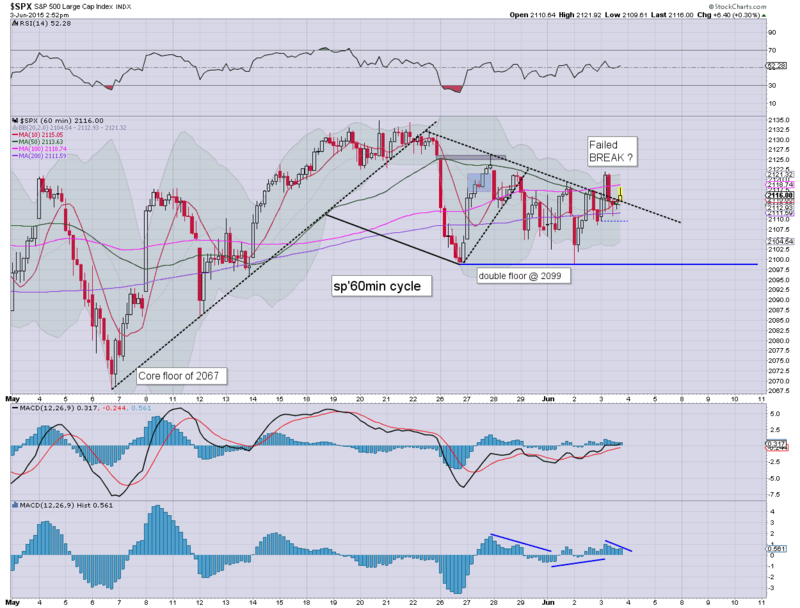 Further weakness to the sp'2080s looks due.